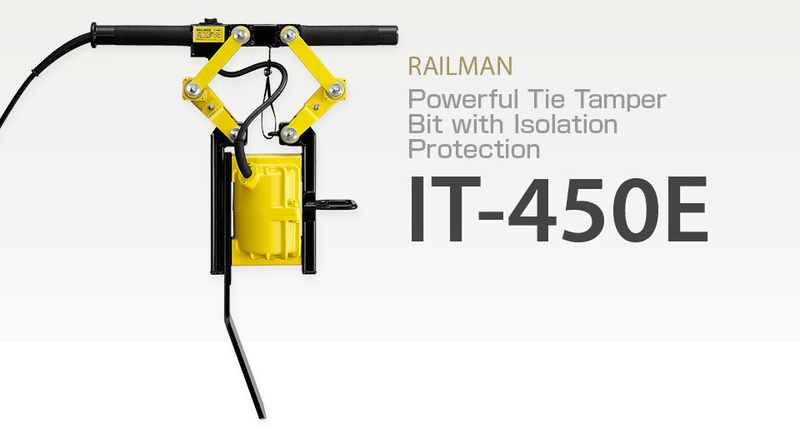 RAILMAN's Next Generation Tie Tamper IT-450E. Built-in short circuit prevention function, Smart Handle to cut vibrations and reduce fatigue, shared 50/60Hz specs, improved service (repairs, maintenance inspections), and quick response to requests for voltage specs for products for export. IT-450E is equipped with isolation protection to keep any electricity leakage out of the bit, which in turn stops electricity from being conducted through the bit to the rails, where it would run the risk of interfering with railway crossing signals. This tie tamper, with its state-of-the-art design, ensures safe rail maintenance. 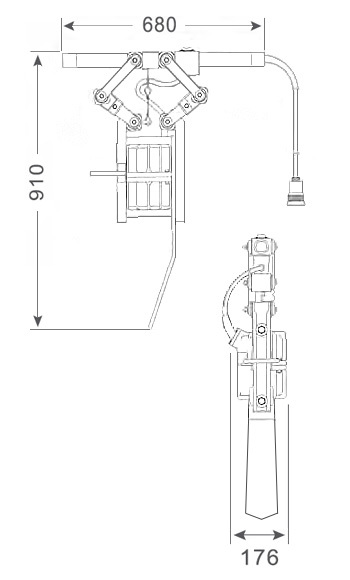 When tamper is in operation, the handle can be simply rotated to change the direction of the bit without touching the body of the operator. By reducing wasted movement, productivity is improved and operator fatigue reduced. These smart handles are RAILMAN's best when it comes to reducing operator fatigue. The 3-coordinate composite value is now displayed in product specs in keeping with LSB 0710:2009/7/10 from the Ministry of Health, Labor and Welfare. IT-450E uses the same isolation protection structure used in jackhammers. Anti-vibration rubber safely isolates to keep all but minimum vibration from reaching operators. As a motor manufacturer, RAILMAN products have specs that can be used anywhere in Japan. We manufacture our vibration motors in one streamlined process: design, development and production. RAILMAN vibration technology means high-quality vibrations generated precisely and accurately. Our designs and processing techniques also ensure a long service life. The IT-450E can be used in either 50Hz or 60Hz areas. Another feature of RAILMAN IT-450E is in the detail of its design, including ease of removing and reattaching nuts and bolts for servicing (repairs and daily maintenance inspection). The tamper has been designed so ballast does not come into direct contact with nuts and bolts, thus preventing damage from rocks. The motor can be removed and replaced by anyone with a few basic tools. As a motor manufacturer, RAILMAN fills orders for export-use machinery with different voltages. We pride ourselves in the fastest production you'll find anywhere. As a vibration motor producer, we have an established reputation for quick response to orders for 400V (380 to 440V) stator specs. Feel free to contact RAILMAN sales staff anytime. ※Only machinery equipped with standard bits have protective isolation.